I have wasted so many years going to a Dentist who didnt care about ME. WOW!! Dr. Pinner and his staff are amazing! Dr. Pinner won't hurt you and you feel like you are spending time with friends. I will never go anywhere else! My kids love him! Also he has these cool glasses you can wear and watch a movie while he works!! 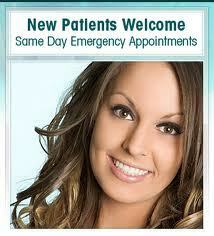 I was not looking forward to my appointment, but you guys always make me feel so comfortable. Whenever a dental conversation comes up, I always tell people I have the BEST Dentist and give them your info! You guys always go the extra mile, and I appreciate that. It says something about what kind of person Dr.Pinner is when you see the same smiling faces greeting you in the office! Fran, Carol and Olga have been there ever since I have been coming, (20 years!) and I love Susan, their newest girl in the front! What a great office! I love Dr. Pinner and his wonderful staff! This is the FIRST time in my life I have left the dentist office and I wasn't crying! Dr. Pinner and Fran are halarious! I feel like I am going to visit friends! Not actually going to the Dentist! No wonder he is a Top Dentist in Houston! I have had some bad dental experiences growing up. I didnt ever want to go back to the Dentist. I was so scared the first time I went, and only because I could'nt put it off any longer. My tooth was killing me! A co-worker raved about Dr. Pinner so I went. Wow have things changed in the 20 years since I've been! He was so gentle and made sure that I did'nt feel anything! It was a great visit! I got to watch a movie! I am so mad at myself that I waited so long! Now I make sure to go every 6 months! Dr. Pinner told me he hates getting shots! So he takes extra time and makes sure you don't feel it! I love this office!! And he rides a Harley! This was my first visit and I was so nervous but Dr. Pinner and his staff were so kind and gentle! I got to watch a movie while he worked on me! I didnt want to leave! Everyone in our office goes to Dr. Pinner! We call him the Dental Magician! Everyone is so nice at his office! Very relaxed atmosphere. I love it because you can watch a movie while you are getting work done! Beautiful office. Caring staff. GREAT DENTIST! Great personality....I havent been to the Dentist in a long time. They dont lecture you or judge you. Olga cleaned my teeth. She has the most gentle hands and the most pleasant voice! Dr. Pinner takes so much time explaining what needs to be done. I felt so comfortable there! I loved it! Actually cant wait to go back!! I love how I can watch a movie while I am in the dental chair! I call Dr. Pinner "The Tooth Whisperer"! He is the best! My kids LOVE going to the Dentist ever since we started seeing Dr. Pinner! They make it fun! Dr. Pinner and his great staff always make me feel like I am special! My family has been coming to Dr. Pinner for 20 years! He gives the best injections! He takes his time and doesnt want you to feel anything! All the staff is great! Love the new office! Please tell Dr. Pinner and Franny my Front teeth look and feel great! Great job! I am so happy! I just got married and moved to Dallas, but I will always come back to see Dr. Pinner!! I love the new office! Susan, Fran, Olga and Dr. Pinner are the best! I would rather go to Dr. Pinner than go get a haircut! Dr. Pinner is the coolest Dentist!